Rafferty had previously been a "one-hit wonder" five years earlier in 1973, when his band Stealers Wheel topped the charts with "Stuck in the Middle With You." Stealers Wheel was led by Rafferty and Joe Egan, friends since both were sixteen-year-olds playing in bands in their hometown of Paisley, Scotland, a bleak industrial city near Glasgow. To Rafferty's utter disbelief, his parody of Bob Dylan's paranoia, tossed off as little more than a joke, struck pay dirt in the States -- by which time he had already said goodbye to the band. "I was going through a very strange period in my life right then," he explained. "I'd got married, had a child, I was twenty-four, and one day it was like I'd been living in a dream for six or eight years and suddenly I woke up. It was a pretty scary kind of feeling. Perhaps I was on the edge of a nervous breakdown -- that's how it felt, anyway. I just had to get away, away from groups, managers, record companies, the whole thing. So I picked up and moved [from London] back to Scotland to sort myself out." Before long, Rafferty and Egan decided "it was time to stop the whole f---ing farce," which they did after completing a lackluster third album, Right or Wrong, with another producer. But extricating himself from his management deal took Rafferty three more years, during which he commuted unhappily to London from the town outside Glasgow where he and his family resided. His frustration during this period underlies "Baker Street," which took its name from the London street where he often stayed in a friend's flat. And the final resolution of his legal and financial hassles accounts for the understated exhilaration of the song's last verse: "When you wake up it's a new morning/ The sun is shining, it's a new morning/ You're going, you're going home." And where did "Baker Street"'s magnificent and hummable saxophone line come from? At first it was part of the melody, Gerry said, and he reckoned he'd sing it. Then he tried it out on guitar, and that didn't quite sound right. Enter Raphael Ravenscroft, a session saxophonist who came highly recommended, and the rest is history -- or at least a hit single. After "Baker Street" became a huge international success -- reaching number two on the Billboard Hot 100 in the US -- Rafferty's next single, "Right Down the Line," peaked at #12, and the City to City album from which they were culled went platinum and topped the US album chart. Rafferty, who rarely performs live and then only in England and Europe, never repeated the magnitude of "Baker Street's success. - Ken Emerson, Rolling Stone, 8/24/78. This song has also been covered by the Foo Fighters. Rick Springfield performed this song in Rockford, IL on 2/18/05. 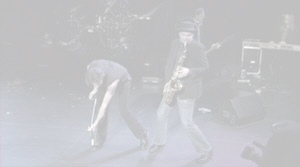 He was accompanied by a sax player (Dino). It is also on his cd "The Day After Yesterday"